Put 2 onto your starting board: 1 in the Ocean, and 1 in a Coastal land of your choice. Extremely good at assaulting the coasts where the Invaders start out strong, but quite weak island - the ocean is not accustomed to affecting events so far ashore. Its Presence shifts in and out like the tide, which can be tricky to manage, but permits re-positioning and tactical retreats or offensives in the hands of a skillful player. Has fairly inexpensive Unique Powers, but the energy gained from drowning Invaders can be necessary in stepping up to more potent Powers. You may place/move into Oceans, but may not place/move into Inland lands. Oceans on boards with any of your are treated as Coastal Wetlands for Powers and . Any Invaders or moved to these Oceans are Drowned. 1 1 2 1 . 2 1 3 +1 . 3 2 4 +2 . 2 1 Drown 1 . 3 2 You may instead Drown 1 . 4 3 Also, Drown 1 / . If the target land is the Ocean, you may Gather another . Target Spirit gains 2 Energy and may Push 1 and up to 2 from one of their lands. If are pushed into your Ocean, you may move them to any Coastal land instead of Drowning them. Ocean's Home / Oceans In Play: In most games of Spirit Island, the oceans aren't in play, they're just there to show which lands are readily accessible from the coast. (This affects where Invaders Explore and where some Powers can be targeted.) Ocean's Hungry Grasp changes this: it can place Presence in the ocean, and where it does, Spirits may use their Powers as if those oceans were wetlands. Drowning: Why is this relevant? Any Invader that's moved into an ocean is drowned (destroyed) - and Ocean gains Energy from consuming them! So other Spirits can use Powers which Push or Gather Invaders to entice, harry, flood, or blow Invaders into the sea, feeding their ally. However, Ocean is limited to the coasts: it can't place Presence into inland (non-coastal) lands. It can still affect them with Powers, if those Powers have the range to reach, but for the most part other Spirits will have to pick up the slack on inland areas. Growth: Ocean's main "add Presence" growth option lets it add 2 Presence at any range - but only to Oceans! Another of its choices has it surging onto the shores, placing one Presence in a coastal land and Pushing one Presence out of each Ocean. ("Push" means "move out to an adjacent land".) Its final option lets it regather its spent Power Cards, but it must also Gather ("move in from an adjacent land") one Presence into each Ocean, retreating back to the sea. Most Spirits don't move their Presence around much once it's placed; Ocean is a clear exception - it can't avoid it! Presence: What are those things on the Energy track? They're Elements - the same as you see on the side of Power Cards. Most mid- and high-complexity spirits have some bonus Elements on their Presence tracks; while those spaces are uncovered, the Spirit gains the shown elements every turn. This makes Innate Powers easier to trigger as the game goes on, and helps with Major Power thresholds. Presence: Once we look past the Elements, we notice something else: the Energy track is terrible. But Ocean gains Energy for drowning Invaders, so it has an alternate supply. A couple of the Growth options give Energy, too, particularly the one involving pulling back to the ocean and regathering strength. Innate: Pound Ships to Splinters - Fear, fear, and more fear. Straightforward enough. It takes Moon, Water, and Air to trigger; the first two are obvious aspects of Ocean, but Air? They all have Water, and most have Moon. But only two have Earth, and only one has Air. When taking new Powers, there's going to be a tension between taking powers with (Air + Water/Moon) and those with (Earth + Water); the former will empower Pound Ships to Splinters, the latter Ocean Breaks the Shore. 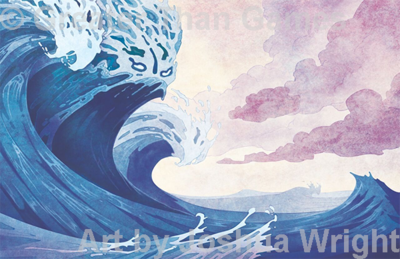 Thematically, the question is whether Ocean's Hungry Grasp shifts more towards its aspect of "stormy sea, sinker of ships, drowner of sailors" or its aspect of "eroding waves, breaker of stone, devourer of islands" as it grows. All of its Powers cost 0 or 1 Energy. Good thing, given its limited base Energy income. Two of the four Powers involve moving Invaders, and one of the four Drowns Invaders directly. So it does start with some ability to feed itself, though it certainly benefits from help by other Spirits. Two of its Power Cards and both its Innate Powers have Range 0. Presence placement is going to be extremely important. The only way Ocean's Hungry Grasp can directly target inland lands at first is by working through another Spirit. A definite weak spot! Call of the Deep - moving Explorers at Fast (before Invaders go) is generally quite useful, as emptying a just-Explored land keeps Invaders from Building there. In this case, though, it's even better: Ocean's Hungry Grasp can Gather Explorers into its briny embrace and eat them. This can only be done at a Sacred Site, though! Here, Ocean's intrinsic mobility can work for or against it: moving Presence inland or out to sea can form - or break up - Sacred Sites. There's another subtlety worth noting: this Power targets coastal lands. This can be used on an ocean, but if it's used on a normal coastal land, some of those Explorers could be Gathered to the shore from places further inland. Yes! A way to affect the inland game, though it may be tricky to set up, and doesn't result in eating anything immediately. Grasping Tide - Defense! Ocean isn't just good at swallowing Invaders, but keeping them occupied on the shorelines so they don't do as much damage. It's hard to farm - or fight - when the waters of shore and river reach out of their beds and tear your gear apart. It's also pretty intimidating. Swallow the Land-Dwellers - Subsidence, sinkholes, and floods. Sadly, this Power causes Dahan casualties as a side-effect. While Ocean's Hungry Grasp doesn't personally care about the Dahan, it gets nothing from drowning them - the sustenance gained is cancelled out by lessened propitiation from all surviving Dahan on the island - and they're allies in the current fight, so this Power is best used on lands without Dahan. Tidal Boon - Grants another Spirit the shifting energies of the ocean, and with them the power to shift and move both Invaders and Dahan. This benevolence extends to any Dahan the target Spirit may send Ocean's way, granting them safe passage to another coast of the island. Overall: Early in the game, Ocean is going to be primarily concerned with building up and building Energy while keeping the shorelines from getting too badly overrun. As it gets more Presence onto the board, it will gain in raw power level and in ability to target; all those Range-0 powers start being a little easier to find targets for. How it goes from there depends on a combination of which Presence track has been pushed, Power choices, and Energy availability: Ocean's hungry Grasp can grow into a whirlwind frenzy of Fear generation, a full-island "keep the shores under control" defender with moderate coastal offense on the side, or an immense stompy powerhouse slamming the coast with multiple Major Powers. Phantaskippy's guide to Phantasms, part 8: Ocean's Hungry Grasp. This page was last edited on 5 October 2017, at 18:29.